Capt. Brad Philipps and his crew on Decisive is off to a very productive start in 2016. They released 943 billfish in January including 84 in a single day! Photo courtesy Guatemala Billfishing Adventures. The nine boats that make up the Casa Vieja Lodge fleet released nearly 2,500 billfish in January. So much for the El Niño hype. Photo courtesy Casa Vieja Lodge. 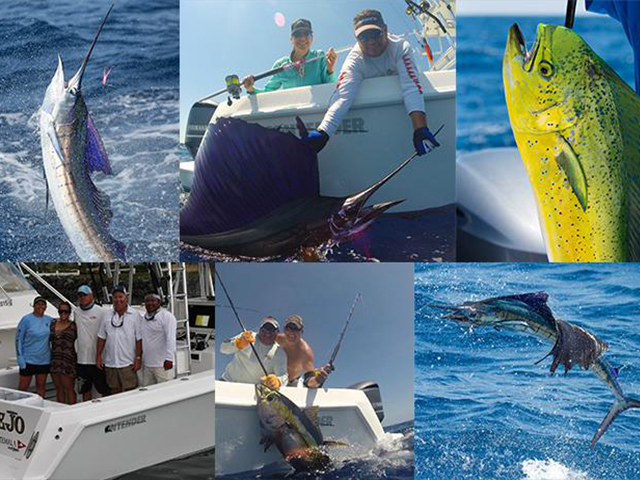 Pacific Fins also enjoyed a busy January with multiple boats raising more than 100 billfish in a single day. Capt. Scott Walker, pictured here, gets in on the action. Photo courtesy Pacific Fins. It's been a very busy year so far for the crews in Guatemala. In the month of January, Capt. 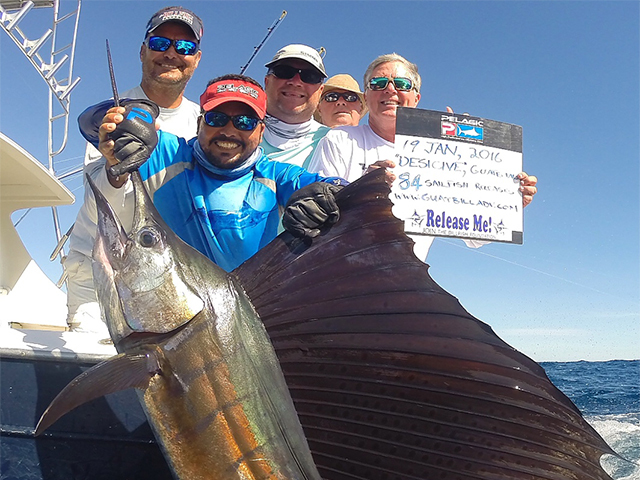 Brad Philipps and his crew on Decisive released 943 billfish in 26 days of fishing, including eight days of throwing the fly. The Casa Vieja Lodge fleet was also extremely busy. Their boats raised 5,108 sailfish in January, tallied nearly 4,000 bites and released 2,475 billfish! “That’s as good as it gets,” says Capt. Brad Philipps. Philipps and crew averaged 36 releases a day. The highlight of January came when the crew released 84 billfish in a single day! Denny Doyle, Bob White and his son Philip, released 84 sailfish from 107 bites. In three days they released 210 sailfish and two blue marlin! Other big days for Decisive included a 78 release day, a 70 release day, some 60-plus release days, and a 48 sailfish and two blue marlin released in one day. 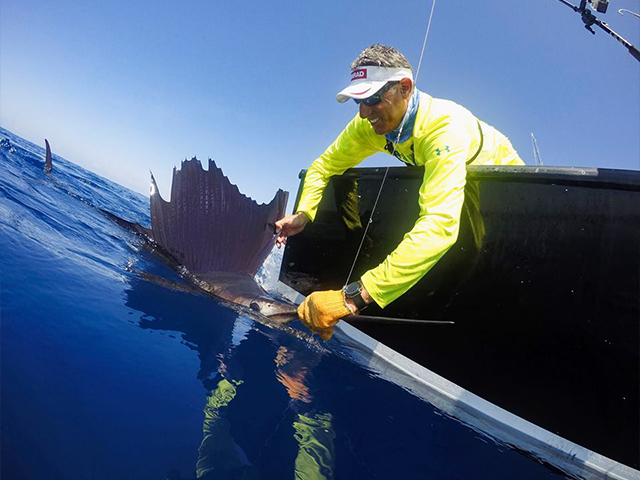 “We finished January off releasing 60 sailfish from 89 bites yesterday with Darren [Philipps’ 7-year-old son] in on the weekend action also.,” Philipps says. The Casa Vieja Lodge fleet of nine boats averaged 150 bites a day over the month of January, collectively. Casa Vieja Lodge's Capt. Chris Sheeder surprised himself by breaking his own record on bait-and-switch raising 126 sailfish, having 120 bites, and releasing a whopping 89 sailfish aboard the Rum Line! Congratulations to the Rum Line Crew and anglers that made these numbers possible! Pacific Fins also put up some big numbers. Here's a report they posted in mid-January: "These are the numbers for the last four groups -- Davis group on Chechos raised 103 sailfish, had 84 bites and released 61 sails and two marlin in three days. Erdman group on Sirena raised 81, had 48 bites and released 18 on FLY in three days. The White group on Maverick raised 136, had 102 bites and released 57 on light tackle and eight on fly in three days. The Bodine group in two days on Sirena raised 101, had 85 bites and released 71!" Going into the 2016 fishing season, many speculated about the effects El Niño might have on the Guatemala fishery. Historically, the fishing in Central America slows down during El Niño years, but that is definitely not the case right now as all of the crews in Guatemala continue to put up impressive numbers. “So much for El Niño and all the other hype, this is still the most consistent fishery out there,” Philipps says. In the first week of February, the Decisive continued to put its clients on fish. One group fished five days and managed to release 247 sailfish from 289 bites, go 1-for-1 on striped marlin and raise three blue marlin that would not eat. “Admittedly the mates were hooking most of the fish but those sort of amazing averages just go to confirm what one can look for with the right circle hooks,” Philipps says. This year's Michaels Organization annual corporate retreat set new records on and off the water in early February. The group fished with several boats in Guatemala and raised a total of 2,718 billfish with a record 1,612 releases! Off the water, the group raised all the necessary funds for the complete renovation & expansion of St. Cecilia School in Buena Vista.